Japan’s Denso Corporation, a reputed global automotive components manufacturer recently signed a Memorandum of Understanding with LAUGFS International, the trading arm of LAUGFS Holdings, a diversified business conglomerate in Sri Lanka, appointing the company as the authorized distributor in Sri Lanka for Denso automotive parts including oil filters, air filters, A/C filters, spark plugs and wiper blades for a range of vehicles. Denso Corporation Japan, the original equipment manufacturer (OEM) for Toyota vehicles, manufactures and sells eco-friendly world-class automotive components and industrial products with strict adherence to safety and quality. The agreement took place following an official visit to Sri Lanka by Mr. Takakazu (Tak) Ukai, Executive Vice President DENSO International Asia Ptr and Mr. Daniel Seng, Market Development, DENSO International Asia Pte Ltd.
“Our team has displayed exceptional performance in areas of sales, marketing and operations, which I believe is one of the main reasons that prompted Denso Corporation to appoint LAUGFS International as the authorized distributor in Sri Lanka. 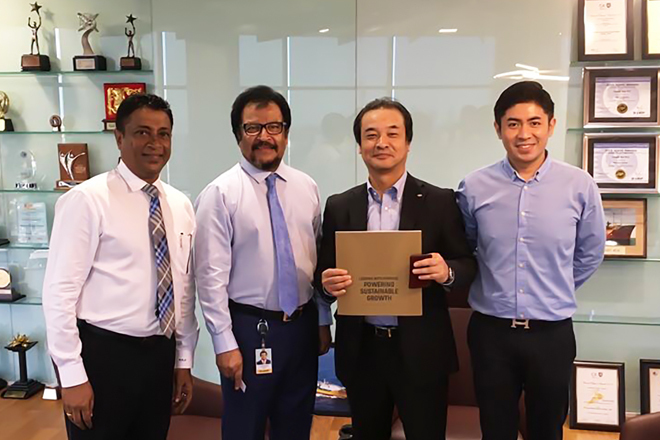 During his visit to Sri Lanka Mr. Takakazu (Tak) Ukai was able to personally witness the synergy that LAUGFS International displays in all areas of business. I am confident that this partnership will lead to further growth and success of both companies,” commented LAUGFS International Chief Executive Officer, Mr. Wasantha De Silva. Denso range of oil filters, air filter, cabin filters, spark plugs and wiper blades are available at LAUGFS Car Care centers as well as through dealers in western, southern and central regions of the country for a range of vehicles including Japanese, Indian and European vehicles. LAUGFS International is the authorized distributor of reputed international brand names such as Yamaha & Airman (generators) and Fujitsu (dry cell batteries) in Sri Lanka and offers a host of products and services under one roof. The partnership with a world renowned company such as Denso Corporation is yet another value addition to the already strong LAUGFS International portfolio and having built a strong reputation for high quality product offerings, LAUGFS International is set to expand its operations island-wide and has extended an invitation to interested business entities to join the company to explore further growth opportunities. LAUGFS is one of the largest diversified business conglomerates and a trusted name in Sri Lanka. Founded in 1995, LAUGFS today has expanded across 20 industries in Sri Lanka and overseas, establishing a strong presence as a leader and pioneer in the power and energy, retail, industrial, services, leisure, logistics and real estate sectors. With over 4,000 employees and an annual turnover exceeding Rs.28 billion, LAUGFS continues to expand and empower millions as a trusted Sri Lankan brand.